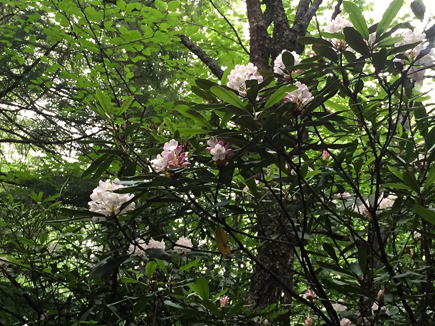 Another shower rolled in as I began writing this, July 1, under our awning, campfire blazing to the left, dogs at my feet. I didn’t make it far before abandoning the post in favor of dinner prep. So I’ve continued this update several days after arriving back home again. Wednesday, July 1 was day three of our first Roomba camping adventure with our dogs. 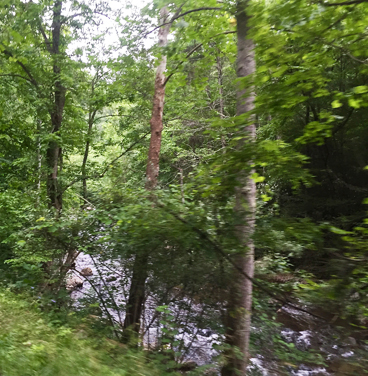 We were in Beartree Park; a National Forest/Park campground in Southwest Virginia. 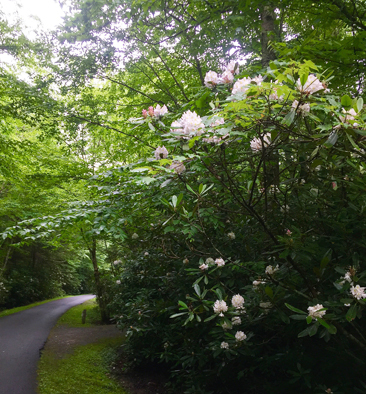 As it turned out, Beartree is one of many campgrounds in this large recreation area that includes Mount Rogers, a part of the Appalachian Trail, and segments of the Creeper Trail. 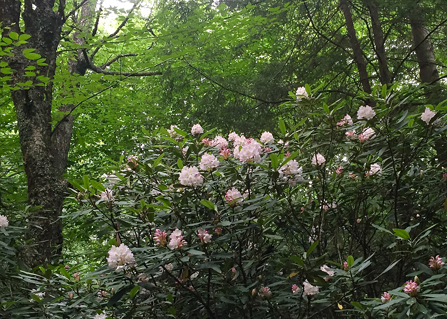 Our site was shady, secluded, and totally surrounded by blooming rhododendrons. 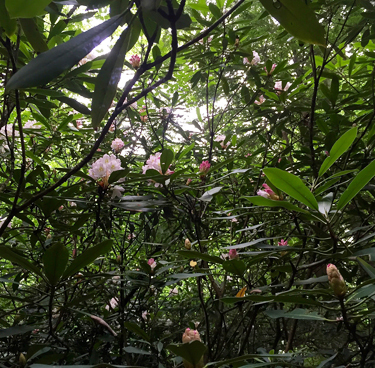 The entire area was just spectacular with blooming rhodies — one of the best years in a while for this “weed” that grows wild all over our SWVA mountains. 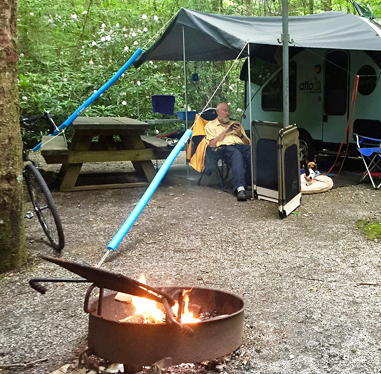 Not too many folks were camping during this week, but we expected most would begin rolling in for the Independence Day holiday as we headed back home. And we were right on that front. This trip was an experiment on several levels: taking the dogs of course, but also leaving the birds alone at home. With no housesitter, we gave the birds a good feed and enough water to last and left. It was overcast, and the forecast was for the same-old/same-old all week, so primarily, I hoped the heavens would provide enough water — I knew all the birds were fat, so I didn’t worry too much about the food situation. Most National Parks don’t have hookups at the campsites. Knowing this, we knew this trip would also be an experiment for us in seeing how long the 12v battery would last without much solar re-charging during the daylight hours (we elected not to carry the generator). As it turned out, we got 4 days (3 nights), before we had to turn off the 12v refrigerator due to the low battery situation. On the first night, our friend, Foxy, joined us in his tent set up in the next-door site. 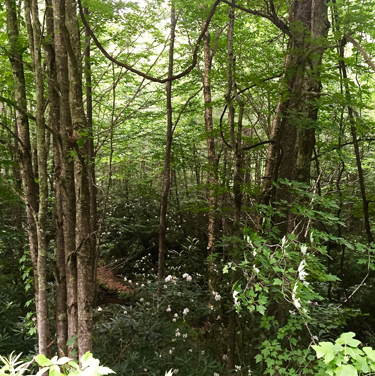 The plan was to head to Damascus and ride some of the Creeper Trail the next day. As it turned out, neither the weather nor Foxy’s health was good enough for us to take a ride on Tuesday. Monday night, Foxy brought appetizers, and we had grilled hamburgers and pasta salad for dinner, with a bit of wine. There might have been some wee drams of a certain adult beverage or two consumed in the dark, beside the campfire. Jack and Foxy chatted long into the night while I read my book inside with the dogs. Not riding on Tuesday was excellent, in terms of helping the dogs feel comfortable in camp. I’m really glad we didn’t have to worry while leaving the dogs in the Roomba for 4 or 5 hours while we rode and had lunch in town. Certainly, it was cool enough. We needn’t have worried about them overheating, so that was a relief. But I worried they’d try to dig their way out of the Roomba, and damage the screens or cushions. After Foxy packed and went home, we just sat around, walked the dogs around the campground, ate, and sat around some more. There might have been a nap thrown in for good measure, to the tunes of the rain dripping on the Roomba roof from the surrounding trees. By the time I began writing this post on Wednesday, the dogs were fully integrated into the scheme of things. So much so, in fact, that they ferociously defended their territory from any and all canine comers (people, however, are totally welcome — the Axe Murderer could come and they’d wag and wiggle and welcome him to our home). Of course, they were leashed the entire time, and we rigged up a “dog run” style containment system with one of our tent pole guy lines. But one time, an innocent camper with her dog was walking past — just as mine had walked past many other sites — and I had just enough time to grab Chase’s leash when he threw himself at the passing dog (not anywhere close enough to cause anyone real fright), crashing the back of my hand into the metal of my camp chair. Ouch. Luckily, there was some ice handy in the cooler, so I could treat the enormous bruise rising on my hand. But it seemed the dogs had taken ownership of our site and the Roomba. While I didn’t care for the behavior, I took it as a good sign. Earlier that day, we’d taken the bikes on a tour of the entire campground, including Beartree Lake. We cycled through the group camping area, another multiple-site area called Beaver Flats (ours was called Chipmunk Circle — with good reason! ), along a walk-in tent camping area, and down to the lake, complete with sandy beach, fishing docks, and a walking trail circumnavigating the lake. It was all uphill back to Chipmunk Circle, so proved to be a good bit of training after all. When we got to our site, I left Jack to keep the dogs company (they’d been alone in the Roomba for about an hour and a half by the time we returned); and I rode down to the gate and back a second time (skipping the campground and lake tours this time). We shared a delicious steak done “Tuscan style” (lemon, olive oil, and garlic) on the grill, plus a broccoli salad and couscous for our final dinner. Awakened on departure day to the sounds of steady rain. As we broke camp, we did, indeed (and finally) run the battery past what was required to run the 12v ‘fridge, so we turned it off and hooked up the car and ran it for a while so we easily had enough juice to lower the roof when the time came. 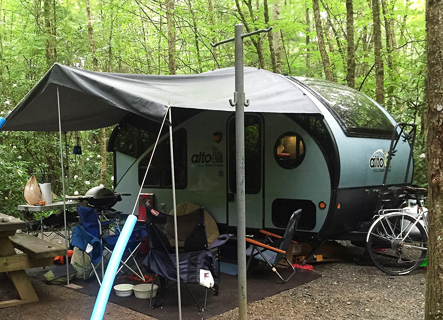 But of course, that was when it started pouring in earnest, and so the canopy/awning and the “footprint” were totally soggy when we packed them up — as were our dog towels; and we got good and soaked as we hitched and stowed. There was zero cell service, so devices were used only for a few low-battery-use games, reading, and their cyclometers. So not charging them wasn’t a problem, and we never tried to charge them up. But we probably ran too many lights at once during our stay, and we certainly chose an unfortunate time to experiment with the water pump and water heater. But now we know. Actually, I was impressed that it lasted three nights in total shade and overcast, running the ‘fridge and lights. We continue to find we have loads and loads of storage space going unused. So we’re going to figure out how to carry along the generator when we know there will be times we might need it (and are allowed to crank it up). 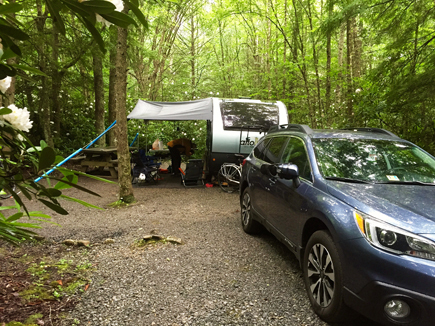 But this was a great short trip to a nearby (2.5 to 3 hour drive) camping area that is lovely and offers many of the amenities we seek. And we’ve stepped another rung up the ladder affixed to our learning curve.